Cam's Cinematic Episodes: Epi-Cast: Episode 29 - "Thor. What Is It Good For?" 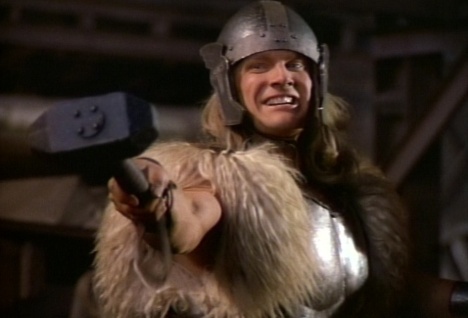 Epi-Cast: Episode 29 - "Thor. What Is It Good For?" Ho, ye loyal and chivalrous podcast audience! Thine champions Cam and Tom have returned from exile beyond yon hills and meadows far to deliver another message of cinematic wit and wisdom. Forsooth, thou verily needst to download this audio bounty from thou powers above. Lies, you say? I say thee, NAY! In this divine episode, the mighty duo review Marvel's latest summer spectacular Thor! They also share discourse over the merits of Duncan Jones' Source Code, scoff at Zack Snyder's Sucker Punch, and critique Peter Weir's The Way Back, Doug Liman's Fair Game and... Sylvester Stallone's Staying Alive (?). In the arena of trailers, they utter their thoughts on Transformer: Dark of the Moon, The Immortals, Rise of the Planet of the Apes and Real Steel. Aye, 'tis a good one. To download, simply right-click and save on the green episode title above. Then you are free to indulge in one of the wild worldwide web's most majestic mp3 treasures.